As we are heading towards the end of the Summer Holidays and it can get a little bit Stressful for Parents, I thought I would do a giveaway thats a little bit different!! Who would like to win A Bed Of Nails ? 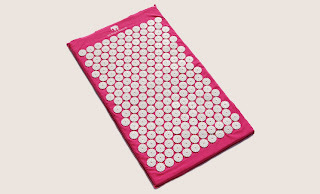 Bed of Nails works similar to acupuncture, the pressure of the rounded nails against the skin may help the body release endorphins, the body's very own "happiness drug" which provides a sense of joy, energy and painrelief, and oxytocin, which makes You calm and relaxed ( yes, it is possible to feel energetic and be relaxed at the same time!). Everybody reacts differently to Bed of Nails, and the effects can even vary from time to time; You may feel tired, hungry, happy, alert. Alot of people experience feelings of happiness, relaxation and hightened body temperature. To be in with a chance of winning this lovely Pink Bed Of Nails just follow this blog via GFC, Networked Blogs or via email. Then leave me a comment below telling me how you are following. With two weeks left of the Summer Holidays, I am amazed how quickly they have gone, which means I must start thinking about replenishing school uniform!! I have already discovered that all of the children have increased their shoe size, and looking at some of their summer clothes, they are definitely starting to look a little snug. Xene and Lochlan have to wear a school blazer and tie, which leaves me the task of buying white shirts and black trousers. Neva and Kaide wear school jumpers or cardigans, meaning I have to buy either grey or navy skirts or trousers and white polo shirts. Kaide has got to be THE worst child for keeping uniform clean, every day he comes home with a new coloured polo top, from spaghetti, tomato katchup, paint or good old fashioned mud! When I heard that Asda were going to use soldiers and a military assault course to put their uniform through its paces, I was very intrigued. George at Asda launches its uniform range with military precision, enlisting the expertise of hundreds of kids and helped by the military to put this year’s Back to School uniforms to the ultimate test. George challenged the UK's toughest men and pupils to put the range through its paces, testing strength, durability and quality on one of the UK's most difficult army assault courses. 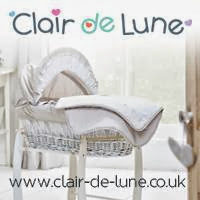 It follows 3,000 days of rigorous independent blind testing through Cambridge Market Research where 100 mums and 100 kids tested the range. Results highlighted that eight in 10 mums thought the uniform was better than their usual brand while 83% would recommend it to other mums. This week, skirts, jumpers, shirts, trousers, shoes and blazers were put through rigorous combat training including racing over cargo nets, fireman’s poles, charging through muddy tunnels, crawling under replica barbed-wire, splashing through muddy water and extreme playground conditions plus the biggest obstacle of the day, a tough rope swing into a giant water pool. The uniform took on the challenge and stood up to the extreme testing with Teflon coated skirts and trousers nominated theday's overall winners and ‘toughest uniforms’ –staying completely dry throughout the course with the water being visibly repelled and earning the name ‘magic trousers and magic skirts’ from the kids themselves. George school uniform is ‘Chosen by mums, tested by kids and guaranteed by George’, covered by George’s ‘100 day satisfaction guarantee’ allowing mums to return it up to 100 days after purchase if they aren’t completely satisfied. All of my children LOVE baths, especially ones filled with bubbles and toys, so they were rather excited when we were given the opportunity to test the Flexibath Bath Toys. The set has a very wonderful little tray that suctioned to the wall, which Eowyn, aged three loves to play shops and cafes with. 1 very sturdy table Shelf that really does stick with the suction cups. The Flexi Bath™ Toys are made from PP and TPE and comply with all relevant international standards. Both types of materials are free from PVC, Phthalates, BPA, heavy metals and other harmful and hazardous materials. But the one that is the most taken with these toys is Tyrus, currently only having three and a half teeth he enjoys chewing on most things and these are no exception!! They are just so squishy, and as you can see Tyrus enjoys chewing them!! He also thinks they are great for tipping water all over himself, which he finds very amusing, but loves to throw water over anyone else in the bathroom too! 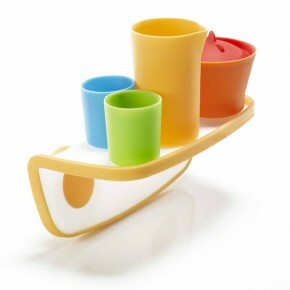 It really is a lovely set and very well priced for bath toys, and the fabulous thing about them is that you can put them in the dishwasher to clean, which is a real bonus, after looking at the state of some of the bath toys I have discarded over the years. Clarks - Back To School Range. I really cannot believe how quickly the summer holidays are passing us by this year, it only seems like yesterday we had finished school, and already we are halfway through! The four school age children had been complaining at the end of term that either their shoes were tight or falling apart, so I knew they would all need new school shoes. all waiting for their turn on the foot measuring machine! 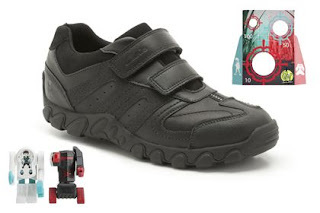 The four eldest children were measured for school shoes, when Eowyn was measured, she had also gone up a size and Tyrus has begun trying to walk, so he needed a pair of cruisers. First up was Xene, she will be the first to admit that she HATES shoe shopping, so I was slightly apprehensive that she would not find a pair to her liking, however, with the new range of Back To School shoes that have promised to be more on trend and fashionable, we actually found a pair that fitted well and she was happy with. 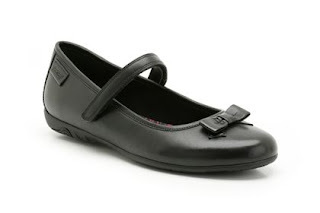 With pretty, and on-trend, bow detailing, these girl's school shoes are styled in smooth black leather. A simple strap fastening offers easy adjustability and fit. Available in whole and half sizes and different width fittings. They made Xene's feet look very neat and are perfect for the new term. Next was Lochlan, who is now in the same size shoe as me!! in terms of style and choosing, Lochlan is never really worried about his school footwear and is quite happy for me to just get them however,he does have a habit of going through shoes quite quickly, so I shall be interested to see how his new ones stand up to the onslaught of his school day. 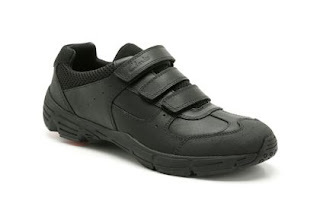 Boys' school shoes with a modern sporty look in durable black leather. Triple rip-tape straps offer easy on-off and adjustability, while Active Air with Air Flow technology ensures superior comfort and breathability. The added benefit of anti-microbial Agion also helps banish bacterial and fungal growth. Available in whole and half sizes and a wide range of width fittings. Neva is the most outdoors of all the children and she will give any pair of shoes a thorough testing, but at the same time she is still quite girly, so she was looking for a sturdy pair of pretty shoes, that were not slip ons, as she tends to flop out of them. 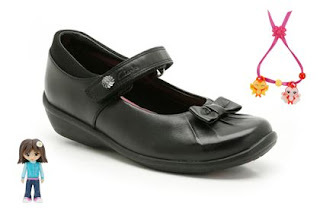 Part of our new Daisy Magic Steps range, these girl's school shoes come in durable black leather with a hidden YoToY doll, pretty bracelet and Sprite charm. Decorated with a pretty bow and metal stud detailing, this style also includes a padded collar for comfort. Available in whole and half sizes and a range of width fittings. Neva loved the free toys in theheels and found the shoes very comfortable, with the very easy to fasten velcro strap that held them in place perfectly. Kaide also has a habit of going through shoes very quickly ( I'm thinking it may be a boy thing!!) he has also grown two shoe sizes in as many months, he is also like Lochlan that he doesn't car too much about style, just as long as they are OK for playing football at lunchtime with the bigger boys, therefore he wanted a pair of school shoes that were more like trainers!! Featuring an intrepid Jack Nano design, these boys' school shoes in coated black leather not only have light reflecting side panels and webbing, they also feature a must-have YoToy in the heel. Double riptape straps ensure secure fastening, while the rigid sole gives extra grip and a toe guard adds durability. Agion microbial linings help keep feet healthy. Available in a range of widths. Kaide LOVES the two robots in his heels and I love the fact that they have a toe guard which may mean less polishing for me!! Also both boys shoes are promoting the fact that they have sorted boys and stinky feet (why is it that males have stinkier feet than us females!!). Eowyn is a real girly girl, so I knew the colours pink or purple would appear, and indeed I was correct. 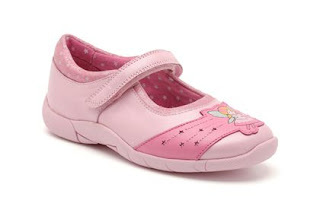 Gorgeous girls' shoes that are pretty and girly, with glittery fairy dust on the lipstick pink leather, as well as a cut-out star design and fairy applique on the right foot. The star patterned lining and a silver inner sock add real 'wow' factor, and underfoot comfort is enhanced by the soft padded footbed. A riptape strap offers secure fastening, and the style comes in whole and half sizes and different width fittings. 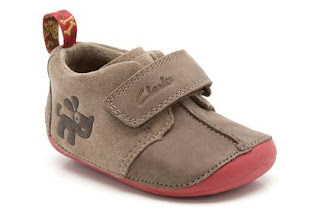 Eowyn immediately fell in love with these shoes, she is also learning to put them on the correct feet and since getting these shoes she has managed much better because when placed next to each other they make a complete picture enabling her to put them on the correct feet. Tyrus isn't quite walking full, although he is trying. He has a problem when visiting his grandparents as they have laminate flooring and he finds it very difficult to keep his balance, he should find it much easier now with his little shoes on, although he did start off scrunching up his toes, making it impossible for me to get the shoes on, once he had them on he wouldn't let me take them off and we ended up taking him home wearing them!! The children were surprisingly very well behaved, but as we all know that is not always the case, especially if you are shoe shopping for one and you have to bring along others too, well Clarks have launched a new Jack Nano app for the iPhone, designed to entertain your children in-store. Clarks Kids have launched a new aurasma app which keeps kids entertained in store. 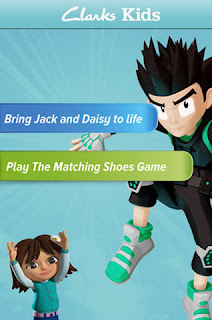 The new app brings Clarks characters Jack Nano and Daisy to life with the characters dancing in the palm of their hands or by playing the “matching shoes” memory game. 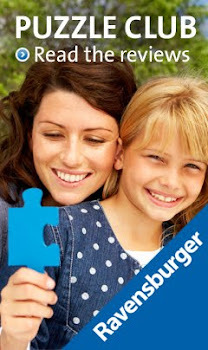 To use in all stores, this app brings to life fun and exciting in-store entertainment. As you will know, if you have read about our family holidays here, we usually go for a cottage in a quiet area and spend the week out and about going to beaches or out walking, so when I heard that Butlins were looking for Ambassadors I was very curious about the whole Big Holiday Experience and applied, although with six children I didn't think I was really in with a shot. 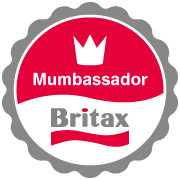 However, last week I found myself with blackberry in hand as the Ambassadors were about to be announced on Twitter and complete and utter shock Hex Mum had actually been chosen!! The children were extremely excited and immediately found the brochure that I had been sent just a few weeks before and began looking at everything that goes in there. After discussing with Asa, he had actually visited the Butlins at Skegness last year for a tourism Conference and had said at the time that it was very nice and not at all what he had imagined it would be like. Of the three Butlins sites, Skegness is the nearest in terms of travelling, and anyone with six children will know, the shorter the car journey the less likely mum is to go insane!! 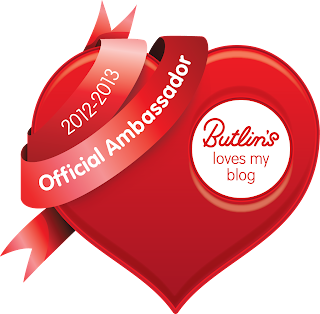 I looked on the Butlins website and typed in our requirements, we decided that the second week of the Easter holidays 2013 would be perfect, we would be home the day before Neva's birthday and no-one would get any letters from schools about holidaying in term time!! Because of our size we would not fit into one of the self catering apartments, however there is a rather nice looking Silver, Dinner Bed and Breakfast with four bedrooms that would do very nicely. I am rather excited as this is a completely new experience for us, even having meals included is a first. A little late, but with six children at home, there never seems to be a spare minute!! This year the beginning of the holidays began very differently, as my husband Asa was actually able to have two entire weeks off from work, being in tourism we usually have to make do with a few days here and there, so we decided VERY last minute that we would go away for a week. Literally six days, before I began looking for a cottage somewhere that didn't cost the earth, forget the travel agents or the holiday brochures, no, I found our perfect little cottage, courtesy of Ebay!! With less than six days until the holiday I began the mammoth task of ensuring we had everything we needed to stay in North Wales, a lovely little village called Chwilog, between Criccieth and Pwllheli. We had planned to set off bright and early Saturday morning, but instead left the house at 10am (not too bad for the eight of us!!). Loaded with snacks, drinks and the DVD players!! The four big ones at the cottage. Saturday was all about settling in and unpacking, and of course choosing who would sleep in which room!! We woke on Sunday morning to find the weather was quite warm, so we decided to attempt a walk up a large hill, hoping that the weather would stay fine. At the beginning of the walk, nice sunny weather! Picnics wouldn't be the same without the rain! It did eventaully stop, although it did make the descent rather slippy. Tyrus, as usual, slept through most of it, and only woke when we reached the bottom. We drove back to the cottage and dried off, the afternoon became much warmer and the children were desperate to do their favourite activity, rock pooling!! They did manage to catch a few Starfish, shrimps and fish, whilst Tyrus and I made sandcastles, well, I made the castles, Tyrus knocked them down and tried to eat the sand!! On Monday we visited the Rabbit Farm, which had many more animals than just Rabbits and it took all of my willpower not to succumb to the gorgeous puppies for sale that my children kept having cuddles with!! Monday afternoon became really hot, so we decided to explore a wonderful beach called Hells Mouth, where it was actually warm enough for the children to take a dip. On Tuesday Asa took Xene and Lochlan off to climb Snowdon, they left very early in the morning and looked very pleased with themselves on their return, but also very tired. Unfortunately, the higher they climbed, the less distance in front of them they could see!! Thursday was a quiet day spent playing in the lovely garden of the cottage, then further requests came for Rock Pooling, so we tried another beach!! The final day of our holiday, we returned to the fabulous Hell Mouth Beach for a proper beach day, complete with beach tent! And that was our first week of the summer holidays, a last minute cottage for only £299, with very little spent throughout the week, and the entire family had a great week.